What software can deliver as much as QUALINAX does in its field?! 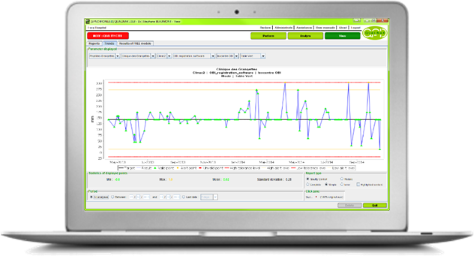 QUALINAX is the first and the most complete software solution available on the market to assist you in the performance, planning and traceability of all Quality Control (QC) and maintenance tasks carried out on external radiation therapy treatment machines (LINACs). And finally, the number of medical devices to be managed by QUALINAX. To manage the human resources required to perform the QC and maintenance2 tasks (rights required to carry out the performance workflows, certification validity, schedules…). The main QUALINAX functions are accessible through interfaces which contain mostly buttons and tabs which guide and accompany you throughout the entire course of your work. 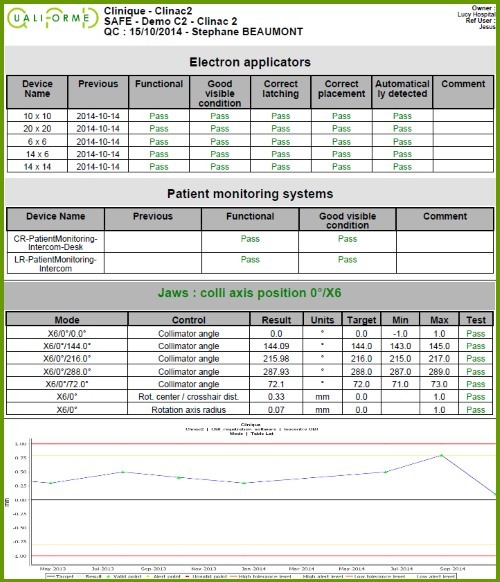 The CMP-QC software component for assistance in carrying out all “traditional” quality controls of treatment machines excepting those which are specifically devoted to safety systems and to calibration of “Monitor Units” requiring, respectively, the MOD-SAFE and MOD-DOSE-A modules. 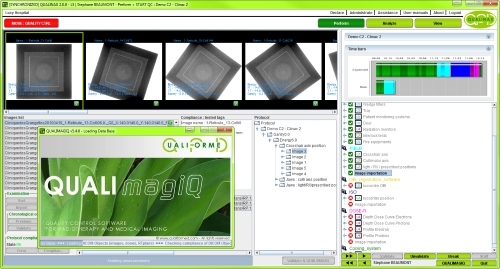 The CMP-QC component receives, stores and formats the quality control measurements, which it sends to the QUALIMAGIQ1 software platform for analysis. It then retrieves and stores these analysis results. MOD-SAFE: this module assists in carrying out quality controls (QC) of safety devices and interlocks, edits and automatically analyses the digital forms containing the control results of this type of QC. MOD-FREE: this module assists in carrying out “in-house” quality controls, creates, edits and automatically analyses for this type of QC the digital forms containing control results and/or extracts such results from an MS-EXCEL® spreadsheet, or else retrieves PDF analysis reports originating from a third party automatic QC analysis solution. MOD-DOSE-A: this module assists in carrying out controls of “Monitor Unit” (MU) calibration, edits and automatically analyses the digital forms containing the control results of this type of QC. CMP-SCHED: this component automatically manages the scheduling of QC and maintenance tasks2. 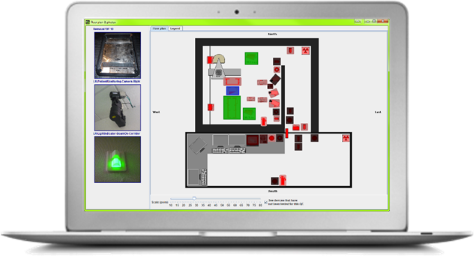 CMP-EVENT: this component enables you to automatically manage, edit and print the digital registries of events occurring on the managed installations, events which are either automatically generated by your work in QUALINAX or manually entered in the dedicated interfaces by the various operators. CMP-MAINT2: this component enables you to interface and exchange information with the relational database included in QUALINAX in regards to the performance of maintenance tasks. This component also provides diagnostic assistance available during corrective maintenance as well as inventory management of spare parts. 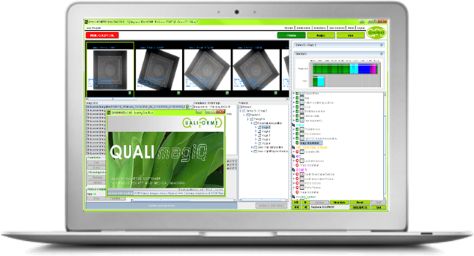 QUALINAX has been optimised to work in conjunction with the QUALIMAGIQ3 platform and its many software modules which automatically analyse measurements derived from quality controls of external radiation therapy and medical imaging installations. QUALINAX downloads the QC measurements to QUALIMAGIQ3 for analysis. The analysis results (XML files) and corresponding PDF reports are then sent back to QUALINAX. Once again, it’s quite simple, no need to manipulate files: just select the installation you wish to view and the type of parameter whose evolution over time you would like to study. The system provides the evolution curve for the selected parameter. A full report composed of the simplified report together with the images, on which their associated measurements are superimposed. The QUALINAX database and the QUALINAX and QUALIMAGIQ1 applications are installed on a virtualised served hosted on a physical server. Clients connect to QUALINAX and QUALIMAGIQ1 with terminals which are thin clients, and which are also virtualised and hosted on the same physical server. Client desktop / Server exchanges are minimal, as only the keyboard and refresh commands are transmitted over the physical network. QUALINAX and QUALIMAGIQ1 may be used simultaneously on several different Client desktops, with the two applications managing any possible conflicts by temporarily limiting designated actions by certain users when other users perform related tasks or when the administrator is configuring the system. 3: The QUALIMAGIQ solution is not included in the basic QUALINAX offer. Furthermore QUALINAX, together with its MOD-FREE module, can also operate with QC measurement analysis software other than QUALIMAGIQ. You need a user manual? Please contact us. Your brochure request has been added to your Download Cart. Complete the form and SEND it. You will get the documents shortly by email.